Its giveaway time ! I haven done one in more then a year, so I figured since it was so fun the last time its time to do one again ! The winner will be able to choose one of my online video tutorials, either the YoolaCuff, YoolaPixieBeads, Yoolpotion charm or the coming very soon YoolaHoops. In order to participate all you have to do is take a look at my etsy shop and leave here a comment with a link to your favorite item on my shop, the comments are moderated to avoid spam so it takes a while before its out there. I love your sterling silver hoop earrings so much i already purchased the pattern. I would love to make the bangles to match and the dvd would be really nice to help me learn even more techniques. Lucky me on the 4th of July! Yoola, your work is so beautiful! 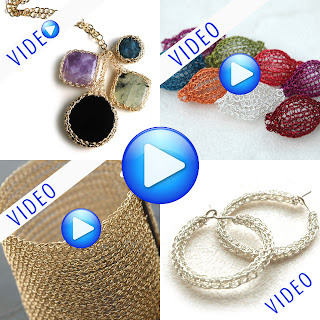 The color of lapis gives mysterious beauty to your wire crochet work. I am in love with the color combination of blue and gold. I love all your work but I'll go for the Wide cuff this time! wish me luck to win!!!! Yoola, your work is wonderful! First time I meet Yoola product was when I search some unique bridal accessories. And I found this http://www.etsy.com/listing/56481274/yoolacuff-bridal-wide-gold-filled-cuff. I feel this product so special and like it very much. So I continue browse on Yoola others products. Oh, how can I possibly choose a favorite? I love all of your work! Yael, I've been a fan for a few years and I'm so excited about this giveaway! I would LOVE to learn to do what you do with wire. It's amazing. Breathtaking and so so classic! Toda rabah! i know what i want if i win…. I am amazed. It is so lovely, hard to imagine metal wire knits so well. I love the pears- a beautiful shape. Hi Yoola! your work is very amazing. Very neat. My favorite pieces are wide crochet cuff and hoop earrings with color handmade pod. Really love to learn how you make your piece. Count me in and fingers crossed for my winning! Oh the gold necklace is awesome! Truly beautiful. Wow, your works are very fine and delicate, absolutely beautiful! Oooh, this is my favorite! since the Violet color is simply amazing and I have a top in just the same color. I love the silver curl with a pearl charm necklace. It's so awesome!!!! So many beautiful pieces!! I love the bangles, loop earrings, and so many more, but I think this sweet ring is my favorite. I love your work!!! My favourite es this http://www.etsy.com/listing/47622658/yoolatubenecklace-a-royal-gold-crochet. I found out about this from Corra. I have been admiring your work for some time now. I really love this one http://www.etsy.com/listing/72908523/onyx-potion-charm-necklace-crocheted I already do a little wire crochet, but your technique is amazing. My favorite item of yours, Yael, has always been the pod beads! Thanks for counting me in.